Wanderlust. The skin between me and the world has dissolved. Instead of retreating from pain and joy and vulnerability, I'm consumed with farsickness. Why wait for a traveling companion? Do I fear the loneliness inherent to my soul ranging the universe on its own? Yes, of course. Wanderlust: giving the soul wild range. In German, fernweh, or farsickness: feeling unsettled at home but grounded on the move as your edges expand and you become permeable to the world in its strangeness and incompleteness. 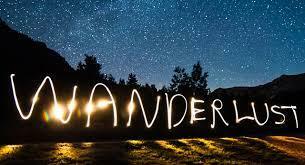 Wanderlust. Fernweh. For years, I gratefully followed my husband's itinerary, one that fed his imagination and desires, as well as professional ambitions. Sometimes they matched my own and we adventured in happy agreement. I tagged along with him, like I did every August as a kid with my parents, sprawled in the back of the station wagon en route to Cape Cod. Nancy Drew books, Nauset beach, and lobster dinners. After the sixth visit, it felt like home. After the twentieth? Nothing surprised me. It was just another place, albeit beautiful, to go to the beach. That sort of travel, just as safe as returning to Cape Cod, might have continued except that I got sick. I'm Bipolar, and for several years, my moods were chaotic: I was chronically suicidal, anorexic, and secretly (or not so secretly) purged everything I ate. So what should have been shared, easeful wanderlust, became more akin to each of us retreating into our own separate, cordoned off journeys. My madness and his corresponding disaffection meant a retreat from joy and spontaneity, necessities of wanderlust. We relied on an itinerary to keep us tied together and moving forward from one place to the next. In our yearly trips to Greece (always, in the last years, Aliki, the same little beautiful bay on the island of Thasos), he shook off the mundane responsibilities of home and of being my watchman, and disappeared into gregariousness, booze, Rebetiko music, and late night conversations with anyone other than me, namely, the woman with whom he eventually had the affair. I was unaware, for years, and thought nothing when she tagged along on our family outings to tavernas and secret beaches and archaeological sites. In hindsight, in contrast to my austere misery unmitigated by the deep, blue sea and the grilled octopus tentacles crisp and charcoal-blackened, and the air redolent with wild thyme and oregano, she dove for octopus with him, and they danced the syrtos late into the night, and drank ouzo and raki in garrulous affection. Me? My soul had folded itself into a tiny, tight packet of hopelessness, the antithesis to wanderlust. I saw every sheer cliff on that island as a place to jump off. After our lazy, cicada buzzing, afternoon meals at the taverna, I threw the beautiful food up behind the tamarisk tree or in a little hole I dug in the sand while my husband swam with the kids. One night, after an argument (he was staying out late and I returning to the room alone), I ran to the beach and swam into the bay, into deep and deeper water, hoping exhaustion would pull me to the bottom. I didn't bother to look up at the cascade of stars. The landscape was contaminated. Instead of fernweh, farsickness, I was emptied out. The final year of our marriage, he went to Greece by himself for two months and I stayed in Pennsylvania with the kids: for me, that well-traveled landscape was marked by my suffering and shame; for him, the landscape offered liberation from me. Travel is complicated. You still bring along your fears and mortifications. In Bucharest, I remember pushing my then two-year old son in his stroller for eight miles a day at a furious pace because I didn't want to stop and rest inside myself. Consequently, I saw nothing and when I look back through photographs, I remember nothing except the night I got so drunk and felt so hopeless that I stood in our narrow apartment kitchen and took a flimsy butcher knife bought at the Romanian equivalent of Big Lots, and cut into my arms. Those scars remain, but I'm now stable, in recovery for five years, and divorced. I no longer want an intermediary between me and the world. No husband driving the rental car around mountain passes. No husband in charge of the bargaining. No husband policing my meals, my exercise, my moods. No husband disappearing into the arms of another, happier woman. Just me. Wanderlust. The skin between me and the world has dissolved. Instead of retreating from pain and joy and vulnerability, I'm consumed with farsickness. Why wait for a traveling companion? Do I fear the loneliness inherent to my soul ranging the universe on its own? Yes, of course. In two weeks, I'll be going solo to Morocco. Not a condo on Cape Cod, not Aliki beach on Thasos, but an utterly unfamiliar landscape. My fears and insecurities will travel with me: bargaining in the souks, trekking into the Sahara, negotiating harassment (I'm tall, a woman, and American), and eating on my own. This last, maybe, is the most challenging. Can I sustain a hopeful, clever, and fulfilling conversation with myself? Plenty of women have adventured before me and done just that. In 1776, Jeanne Baret, dressed as a man, was the first woman to circumnavigate the globe. In 1889, Nellie Bly did it in twenty two days. In 1975, Junko Takei was the first woman to summit Everest. In 1994, Liv Arnesen skied solo to the South Pole. All I have to do is get on a plane, get off, and meet my driver in Marrakech. Amelia Earhart once said this of flying: "After midnight, the moon set, and I was alone with the stars. I have often said that the lure of flying is the lure of beauty." This beauty comes precisely because you fly alone with the stars, because you have the courage to sit with the silence and tumult of the world without and the world within. When I was sick and no longer in love nor loved by my husband, I was estranged from the world's clamor and longed only for my own final silence. Now my stomach tumbles with fernweh and I swoon with wanderlust, and my itinerary follows the stars that I now see when I look up into my night sky.